Yuri Gagarin (1934-1968), the first human in space, Pilot-Cosmonaut of the USSR, Hero of the Soviet Union. A shot from the U.S. documentary "Soviets in Space." Early in the morning of April 12, 1961, a rocket boosted the Vostok spaceship into Earth's orbit. 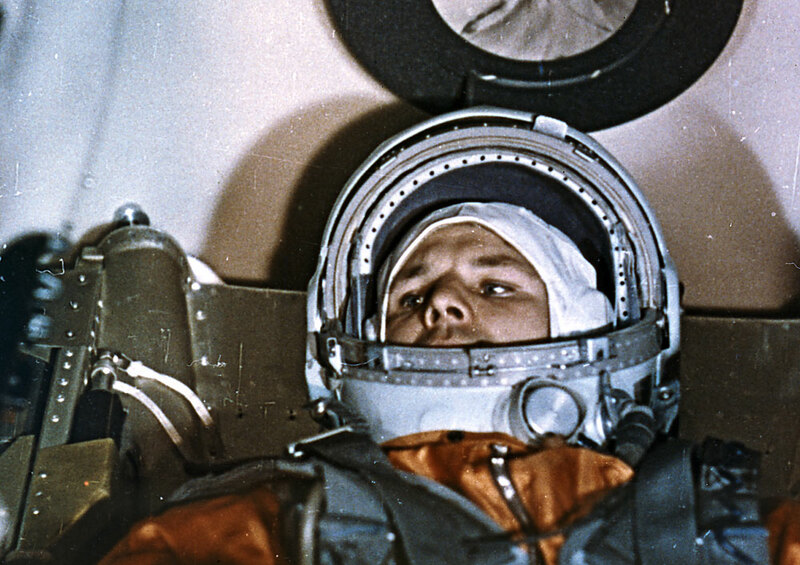 Onboard was mankind's first space traveler, Soviet citizen Yuri Gagarin. Today, he has almost godlike status in Russia, but what do people who were alive in 1961 remember about him? Alexander Rakitsky was a construction engineer before retiring. In 1961 he attended first grade in a Leningrad school (today St. Petersburg). He calls the day Gagarin flew into space "one of the last bright memories of the Soviet people." Here are more of his memories. "April 12, 1961, in Leningrad at School #216 near Vladimirsky Prospect, I was in first grade, in the third lesson, which was Math. The teacher, Tatyana Ivanovna, was saying something while we diligently worked at our desks. One boy was acting silly, however, and making faces. We were laughing and the boy was then kicked out of the room. Suddenly, 5-6 minutes later he flew into the classroom and shouted that a cosmonaut had blasted off! He was again sent out of the room because no one took him seriously. But three minutes later, the school's principal entered and told us that the USSR launched its first cosmonaut, Yuri Gagarin, and that today's lessons would be cancelled. Anatoly Solodukhin had a job testing space modules at the Baikonur Cosmodrome. "For my colleagues and I, April 12, 1961 and the events related to it, are the most vivid memories of our lives," he remembers. "We froze in expectation. The tension was pushing our nerves to the limit. We could hear the buzzing of the ground equipment. Multicolored lights were going on and off on the consoles. Our nerves were about to burst. Launch commander Anatoly Kirillov started giving orders. The operator of the central rocket control console, Chekunov, turned the key and switched on the automatic rocket launch. Then there was a short authoritative command: "Launch!" "We have lift off!" loudly shouted Chekunov at 9:07 a.m. Moscow time. The trusses loosened and fell off from the launch pad. The bunker shook from the increasing din of the engines, and the noise was bursting our ears. "Let's go!" were the words that Yuri Gagarin cried out, and which we heard in the speakers. When we ran out of the bunker our faces were hit with the bright light of the April sun, and our ears were filled with the roar of the rising rocket carrying the spaceship and the first man in space. The rocket rose slowly. Then it sped up. That is how on April 12, 1961 our planet saw the dawn of the space era! We were enchanted, standing outside the bunker with our heads tilted upwards, following Gagarin disappearing in the sky. Everyone had tears in their eyes - tears of joy." Five-year-old Rumia Nurskanova and her grandmother were the first people to encounter Yuri Gagarin after his landing in the countryside outside of the city of Saratov. They were living in the village of Smelovka, and on April 12 they were planting potatoes. "The whole time I was twirling and looking up at the sky. I saw two red dots, but my grandmother scolded me and told me to continue planting potatoes. I continued with my work and forgot about the object in the sky. Later, I saw an enormous number of ropes on the ground, from where an orange monster was rising and coming our way. I told my grandmother, 'You didn't want to look up at the sky, but now he's here.' She saw it, got up, grabbed my hand and started praying. I was also afraid and I hugged her. Then we turned around and ran towards the landing, which occurred near our home. At that moment he shouted, 'Mother, wait, I'm a Russian.' My grandmother stopped and he approached us. She helped him take off his space helmet. I could see his face, he was smiling. My grandmother asked him, 'Where are you from, who are you?' We hadn't known anything about the flight. There was no radio, no light at home. He said he came with the ship. My grandmother was stunned and asked where the ship was, because there was no water around. 'I'm from space,' replied the cosmonaut. I stayed behind to guard the potatoes because a calf had run up to the bucket and started eating them. At that moment, the potatoes were more important than Gagarin. My grandmother then went to look at the spaceship. I was so afraid, I started crying."